West Side Park had beautiful trails, with concerts in the summer and sledders on its slopes in the winter. Sporting facilities there were tennis and baseball. A lake was also in the park. 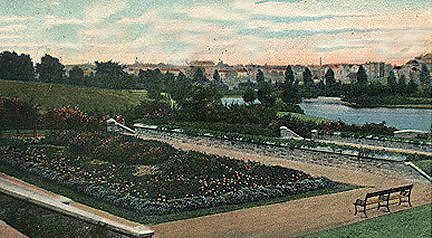 On January 30, 1896 Mayor Lubkuecher penned a letter to the Essex County Park Commission calling for the need of a park in the “Hill Section” of the city. This need was downplayed until word got out that the East Side Park was to be built. After that local west side associations began a siege of communications and delegations to bring pressure upon the Commission to establish a West Side Park. At the end of March 1896 the West End Improvement Association (which included the mayor) made a forcible presentation for the park to the commission. Their presentation stated that there was an imperative need of a park in proximity to the large public school there and that there were close to 70,000 people in the western portion of the city. They asked for the park to be built in the vicinity of Eleventh Street, Seventeenth Street, and from Sixteenth to Eighteenth Avenue. At a meeting on October 2nd the commission was reminded that a park was to be located on the East Side so why should it not follow that same precedent and build one on the West Side. On October 29, 1896 the Newark Board of Works requested a conference with the commission which was granted for November 9th. At that meeting they recommended a location somewhere between Springfield and South Orange Avenues, west of South Tenth Street and to include the Magnolia swamp. The commission decided to build a West Side Park in early 1897 and in February maps were ordered and land options and purchases were authorized. The West End residents would get their park. Initially the estimated cost would be $75,000. One year later cash disbursements for land and buildings amounted to $172,234. The area of the park would be 23 acres with a small lake or pond, attractive stretches of turf and effective tree and shrub plantations. West Side Park provides a breathing place for the people in the western section of the city. It contains 23 acres. In it there is a running track and athletic grounds, with suitable locker-rooms, tennis courts, a band stand, and a playground, sand court and wading pool for small children. Part of the park includes some of the highest land in the city, and a broad esplanade along along the western border commands a fine view of the eastern and western sections of the municipality. The land in this park cost $145,740.92, the buildings, $27,501.50, and the improvements $121,208.94. In the park there are 1.75 miles of paths, but no roads.